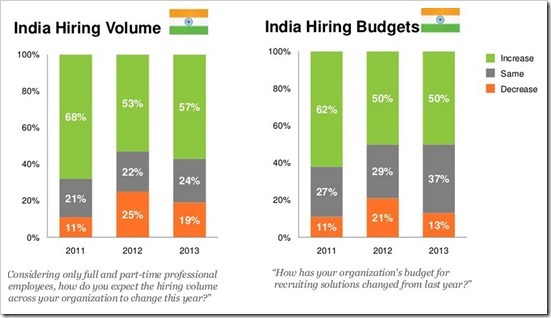 Indian Recruitment Trends 2013: Higher Budgets, Social Media Utilization & Internal Hiring! HR managers across the world are constantly looking at adopting new and efficient recruitment practices to make sure that their organizations are able to acquire and retain talent. Having right human resources is probably the most important aspect of an organization to keep themselves ahead of curve, especially in a talent driven economy. LinkedIn’s annual global recruiting trends report offers a pulse on where recruitment industry is headed and what are currently the most popular trends among the HR Departments. The report found that Social professional networks are increasingly impacting the quality of hires done in an organization. The report based on interviews with over 3300 acquisition leaders finds that the hiring volumes are increasing faster than the budgets allocated to HR departments. While 57 percent of the respondents said that their hiring volume in increased in 2013, only 50 percent saw increase in budgets. Another important aspect which is not becoming core to recruitment process is “Social Network Recruitment”. In India, it has become the fastest growing source for quality hires. There is another aspect in which Social Networks play a very important role – Employer Branding. Report finds that professional networks like LinkedIn are second most effective channel for the employer brand to be seen and heard. Employer Branding works in both ways, while it can be a means of great advantage, it also is source of competitive threat. However, investment in Employer branding is on the rise because good brand has a significant impact on the ability to hire great talent. Another interesting finding, where Indian recruitment differs from their global peers, is – use of data to measure employee brand. Over half of Indian companies think that they utilize data well to make hiring decisions, while less than 23 percent think the same globally. Internal hiring is now taken very seriously with 94 percent of Indian companies investing either more or the same as compared to previous. The report finds that recruiting organizations are not investing enough on mobile channels. While over half of the candidates would prefer using mobile to learn and apply for new opportunities, only 13 percent companies are investing adequately to meet the demand. Check out the Full Global Recruitment Trends Report by LinkedIn Talent Solutions. Tegra 3 powered XOLO Play T1000 Coming on Jul 15th!